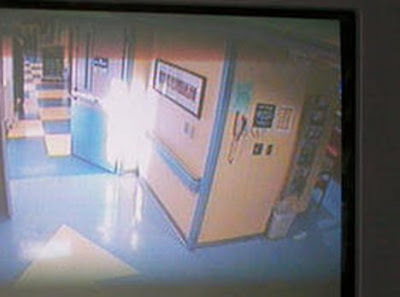 A mother, whose daughter was fighting for her life, believes that a photograph taken in a hospital ward shows an angel. Colleen Banton, from Charlotte, North Carolina, was facing the agonising decision of taking her daughter off a life-support machine when the 'miracle' occurred. 14-year-old Chelsea had been admitted to the hospital with pneumonia, but a series of subsequent infections and a collapsed lung left the teenager breathing with the help of a ventilator. As friends and family gathered to say their final goodbyes, Mrs Banton was alerted to an unusual bright light by a nurse. A first attempt at capturing the image with a digital camera was unsuccessful: 'The first picture wouldn't take,' she said. The second time she succeeded, and the mother-of-two sought solace in the image while her daughter's oxygen mask was removed. Both family and staff were stunned when Chelsea began breathing for herself. Two weeks later, the teenager was sent home from hospital, in time for her 15th birthday on Christmas day. 'If they doubt it, that's fine... But I know what I saw, and the picture's untouched. I didn't make it up. That's just something that I believe. Mrs Banton revealed that she and her older daughter had been 'praying for a miracle' since Chelsea was born five weeks prematurely, and was given 36 hours to live. 'She spent the first four months in a neonatal intensive care unit,' recalled her mother. Against the odds, Chelsea - who has suffered from pneumonia, hydrocephalus, requiring a shunt in her skull, and life-threatening viruses throughout her childhood - is now at high school. 'I'm learning that every day she's alive is a miracle.' said Mrs Banton.